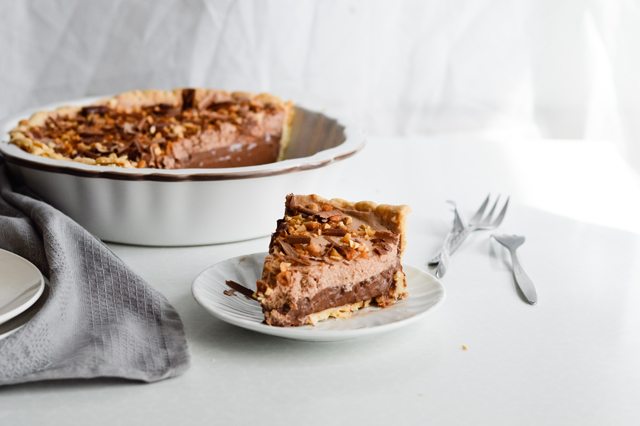 Chocolate pudding pie with Nutella is here to answer your biggest chocolate cravings! Happy first day of May everyone! 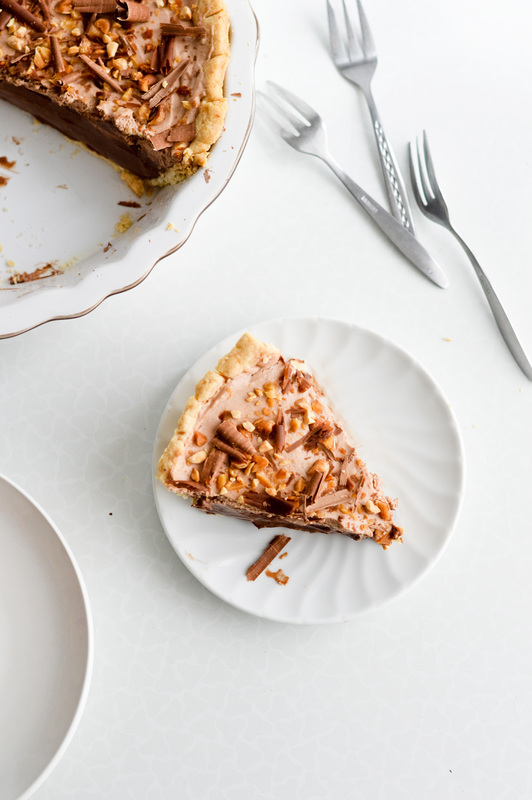 I am so happy to finally share this chocolate pie recipe. Seriously, I’ve been holding off for far too long. Not because this isn’t good, it is actually, it’s very good. And not that I’d ever say no to chocolate pie or that I need good reason for making one, but I still somehow can’t fully justify making a pie every week (on top of everything else), eating it all the time. But the time has now come, because I want you to make this over the weekend. This pie is like a childhood dream. 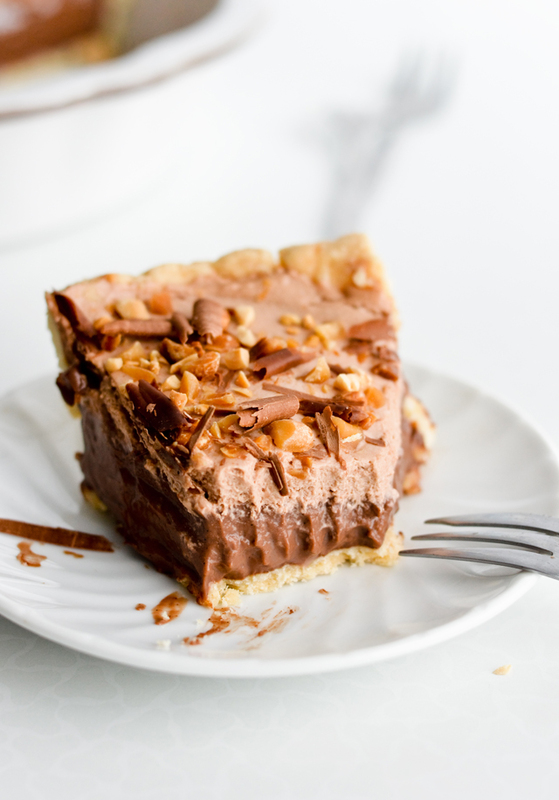 Growing up I loved apple pie and chocolate pudding, but I never really had chocolate pie. It just wasn’t a thing around here. Out of all the chocolate desserts (not counting crepes with Nutella) my mom most often made a chocolate roll, decadent and delicious I have to say, but different from chocolate pie. And she didn’t make it very often anyway. It wasn’t until my grown up years that I truly began discovering the world of pies beyond the classic pastry + fruit combination, with fillings including everything from mascarpone to white chocolate mousse to chocolate pudding. If you’ve ever made pudding at home you know that most recipes usually call for eggs. And the very first time I made this chocolate pie I made a chocolate custard too. I mean, it tastes amazing, so why not do it this way? But I soon realized that it makes the pie too heavy. Not “I can’t eat this at all” heavy, I couldn’t possibly reject a delicious chocolate pudding, but still too heavy once you add the whipped cream. I want to enjoy chocolate pie, not make myself sick. In general terms, making a heavy pudding isn’t even a real problem. But for those of us who love pies and cooking (I’m sure you guys can relate), this was a small problem that needed fixing. And the solution was very clear – skip the eggs. And so the chocolate pudding in this pie is made without eggs. I think the chocolate flavor is more intense this way and while the pudding doesn’t seem that much lighter in texture it definitely feels different once you eat it. It sets differently in your stomach, if you want me to be as descriptive as possible. And while a chocolate pie is good enough without any additional toppings, I believe the Nutella flavored whipped cream compliments the pudding nicely. You might think that adding Nutella to whipped cream is a bit of an overkill, but I promise you it is not. Whipped cream needs a little sugar anyway. It’s what gives the cream some flavor and hides the strong dairy taste. Nutella does just that, but better. It sweetens the whipped cream and adds the well known chocolate hazelnut flavor to the mix. I promise you this cream is not as strong as a tablespoon of Nutella on its own. For a cherry on top, I like to scatter chopped toasted peanuts and chocolate shavings over the pie, both demand little effort but give a nice visual effect. 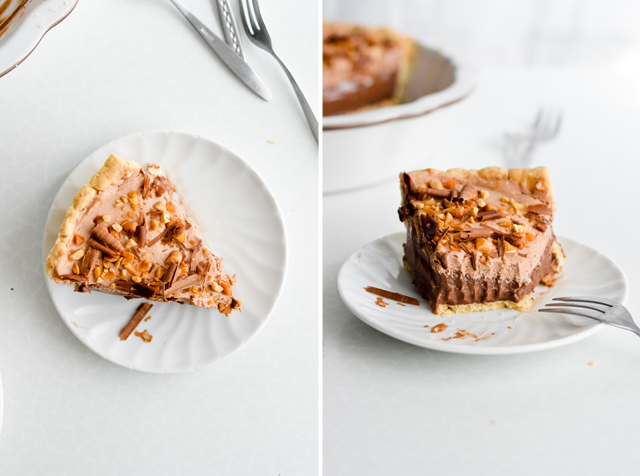 Overall this pie is just amazing, the best answer to a crazy chocolate craving. It’s very chocolaty, crunchy and the filling just melts in your mouth. And while it has many components, it really isn’t difficult to make. I think the pie dough needs the most work, but once you do that, the rest is just stirring and whisking. Your guests will be impressed. Or if you’re making this just for yourself, you’ll wish you had a bigger stomach. Trust me. This recipe makes one 23 to 24 cm (9 to 9 1/2 inch) chocolate pudding pie that is ideally cut into 8 pieces. In a food processor combine the flour, salt and butter. Pulse until the mixture is crumbly. 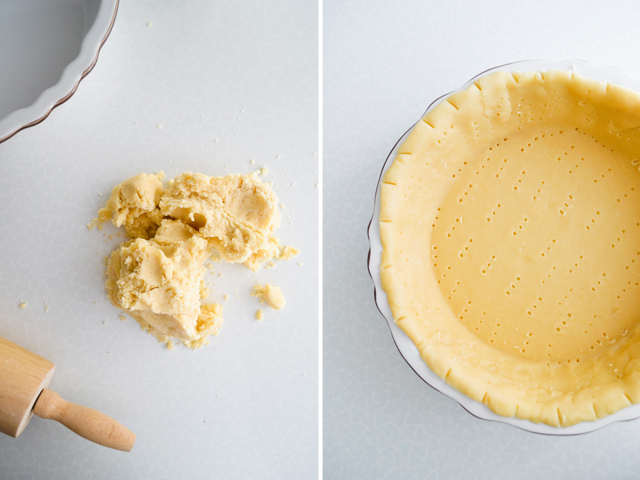 (You can also do this by hand using a pastry blender). Add the water tablespoon by tablespoon and mix it in. You want the dough to stick together if you pinch it, so test it after each added tablespoon. Once the dough is clumpy, transfer it to a (very lightly floured) working surface. Form it in a ball and flatten into a disk. Wrap in plastic wrap and refrigerate for at least 30 minutes (so the butter hardens a bit and the dough isn’t as elastic). Prick the bottom and sides of the pie shell and chill for 15-20 minutes in the freezer, at least 30 minutes (or even overnight) in the fridge. When you are ready to bake, heat the oven to 180°C (375°F) with a baking sheet in the middle of the oven. Line the shell with foil and fill with (baking) beans. Blind bake until the edge is golden, about 10-15 minutes. Remove the foil and beans and bake for another 15 minutes (or more), until the shell is golden all over. Cool shell. 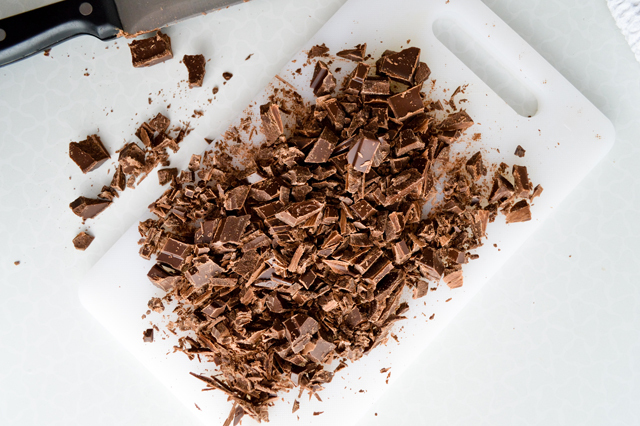 Place chopped chocolate, vanilla and butter in a large heatproof bowl. Set aside. In a heavy saucepan set over medium heat, whisk cornstarch, sugar, cocoa powder and salt. Slowly whisk in milk and bring the mixture to a boil, whisking constantly. Boil for two minutes until the mixture thickens. Remove from heat and pour it over the chocolate. Stir the ingredients until the chocolate and butter are completely melted. Pour the filling into cooled shell, cover the surface with plastic wrap (to prevent a skin from forming) and chill for at least 3-4 hours. Make when you are ready to serve, or a few hours before that. Beat the cream until it barely holds soft peaks. Add the Nutella and gently beat the cream until the Nutella is fully incorporated. 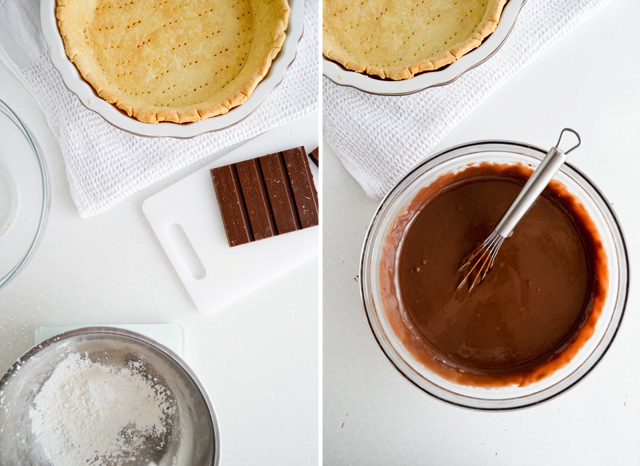 Spread the whipped Nutella cream over the pie, as evenly as you can. Top with chopped toasted peanuts and chocolate shavings. Store pie in the fridge, covered with plastic wrap for up to 2-3 days. It tastes the best on the first day, especially after it’s made, but will still taste pretty much the same the next day. The whipped cream holds together nicely, as long as you keep the pie covered and cool. You can buy toasted peanuts or toast them yourself. Toast on the stove: in a hot pan for a few minutes until they’re aromatic and golden in color. In the oven: in an oven set to 180°C (350°F) for 5-10 minutes, spread over a baking sheet, until they’re aromatic and golden brown. You can also toast the oats, coconut and peanuts together for some extra crunch. 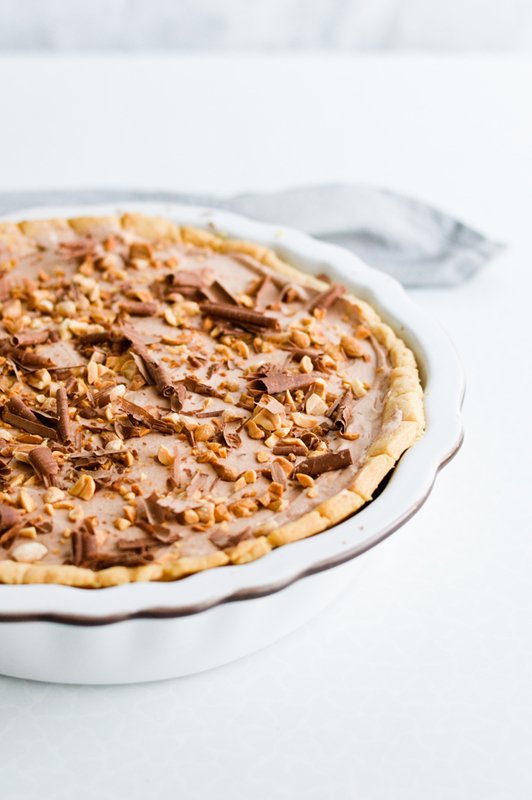 You can use toasted hazelnuts instead of the peanuts, but I think the peanuts add a new dimension to this pie. The cream I always buy has a fat content of 35%, which technically means it’s whipping cream and not heavy cream (which has a fat content of 36% or more). However, this is still closer to heavy cream, so I list that in the recipe. This recipe is adapted from Gourmet. I think Nutella may be the food of gods. For a long time I used a recipe from Epicurious for a Hazelnut Mousse cake that has nutella in it. This looks like it may be an awesome alternative to that! I’ve never made a pudding pie before but I sure am loving my pies lately. I definitely need to try this recipe – that hazelnuty nutella filling looks and sounds so rich and delicious. Thanks Thalia! I love your pies too, ha.